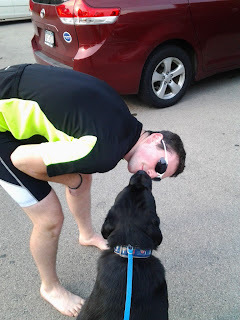 Last night Mike and I registered for our first race of 2014, the Great Lakes 100 Mile Triathlon! Yep, the same one we volunteered for this past weekend (but the Lake Erie venue not the Lake Ontario venue). Then this morning I saw that Mike commented on a Facebook status posted by Score This (they put on a lot of multi-sport events in New York, like Keuka Lake, and also do a lot of timing for other events) that asked about planning for your 2014 racing calendar. He responded almost the exact same way that I would have, that our calendar is almost full (though, not registered for many of the events yet) and that our big race is Ironman Louisville. That made me smile, and I thought about how many benefits there are to being a triathlete couple. 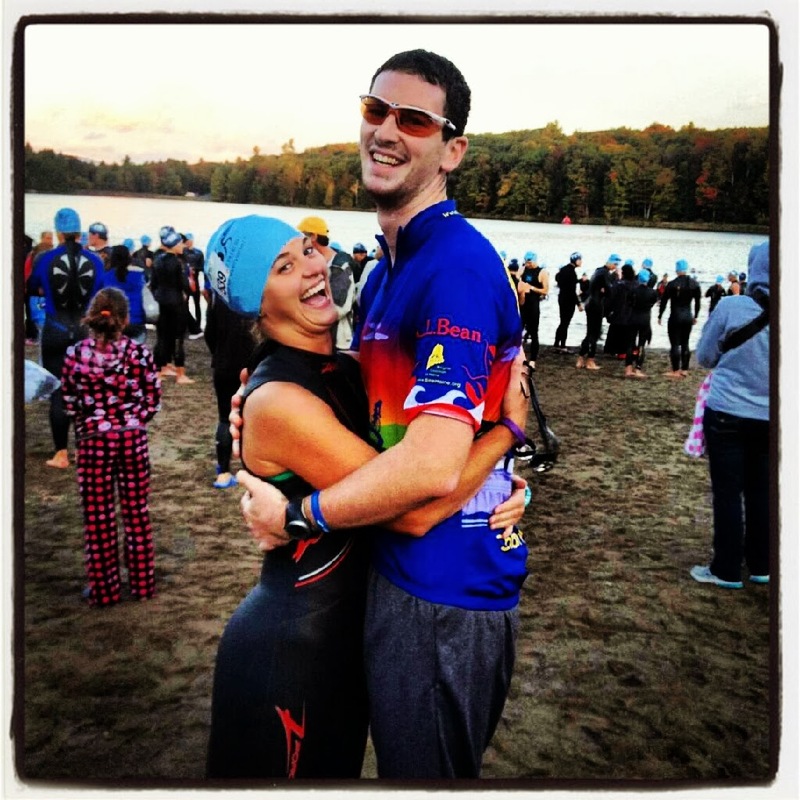 While Mike would be supportive of me if I was the only triathlete in our house, and vice versa, it is nice to be a couple of triathletes that happen to be a couple. 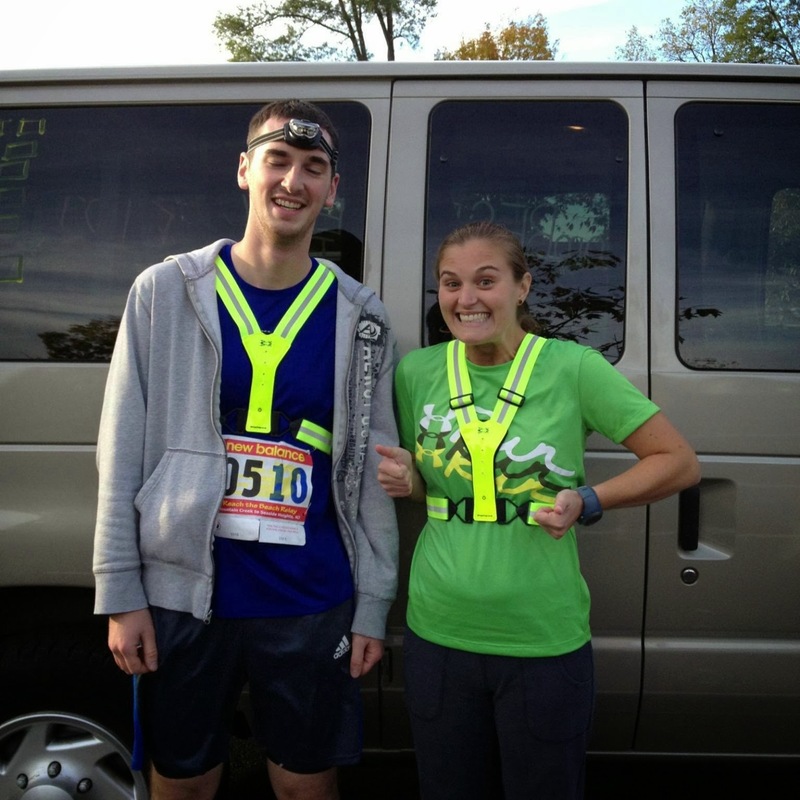 Only a triathlete couple willing does a Du and then a half marathon the next day! For one thing, we get to train together. This may not always be the case with every couple but we are almost the exact same speed when it comes to swimming and running and biking typically work out nicely for us. We do train separately at times due to time constraints, schedules, etc. but for the most part I can always count on Mike to be there to train with me. We get to have each other for support at races. 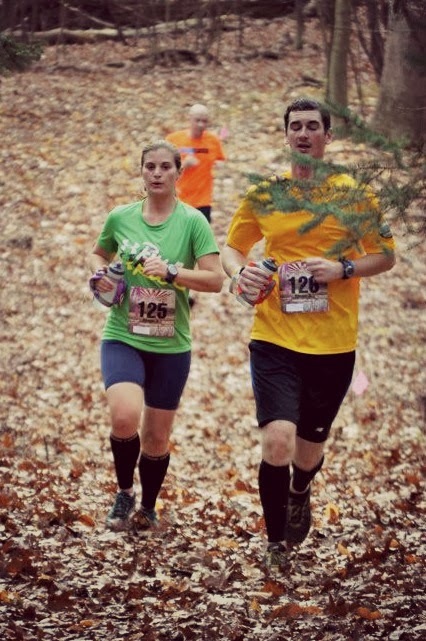 We rarely have raced "together together" (only two times, from what I can remember) but we race the same events. I love seeing Mike out on the course, whether on the bike or during the run, and if we can high five each other it's even better! He is always at the finish line cheering for me, and even though I sometimes give him a stink face I really appreciate his support. Speaking of support, we are there for each other no matter what this crazy sport throws at us. We know the frustrations of being injured (been there done that) and provide support when needed or know when to back off and not say anything. Mike's crash was one of the scariest things we have gone through, but being a triathlete myself helped. And he also didn't mind when I asked the surgeon (luckily he didn't need surgery) when he could start swimming, biking and running again! Support is a family affair! We get it. So many people don't understand why we find enjoyment in running 20 miles, biking 60 miles or running an overnight relay (just to name a few). Mike gets it, and I get it. We can talk about our passion for this sport together and get it. We also don't mind that 10pm is bed time and that we wake up just as early (or earlier) on the weekends for training, since we are both doing it. Who's excited about an overnight relay? We are! 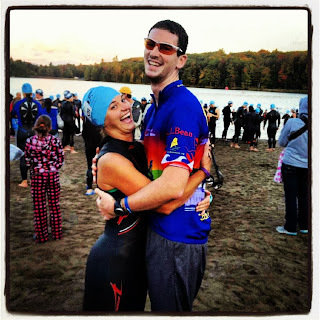 And probably the best part of being a triathlete couple is that we have a lot of fun along the way! Becoming Half Ironmen together was a great day! This is so cute! 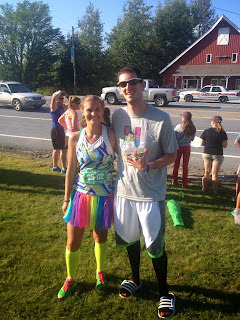 I wish I could get my husband to even run a 5k with me. We share golf, so at least we have a sport we enjoy together, but I would LOVE to get him to run with me. If only I could get Joe on board with endurance sports.... I'm glad that he is so supportive of me and my passion. I just wish that he had the fire within him too. I love all the photos of you two. I can't wait to see your faces soon. You definitely have a lot of fun! I loved looking back at these pics. 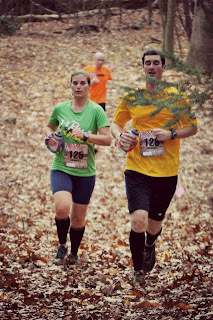 I love that you both do the events together:) My husband runs a lot of the races I do, but usually does it on a whim and doesn't train so I don't have a training partner. I love that you two are able to support each other so much. Love this!! 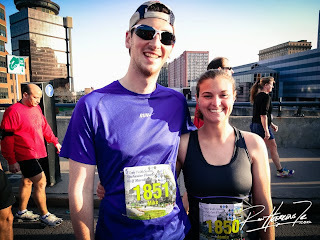 Having my husband to ride with me has made all the difference--I would never have even thought about doing some of the rides I've done if it weren't for him, and I don't think he would have ever considered running if it weren't for me. We plan dates around a long ride and then going out to celebrate which people think is strange, but we get it...and you guys do too. I absolutely love how you've done all of this together. I bet it has been such a strengthening factor in your marriage! So sweet! 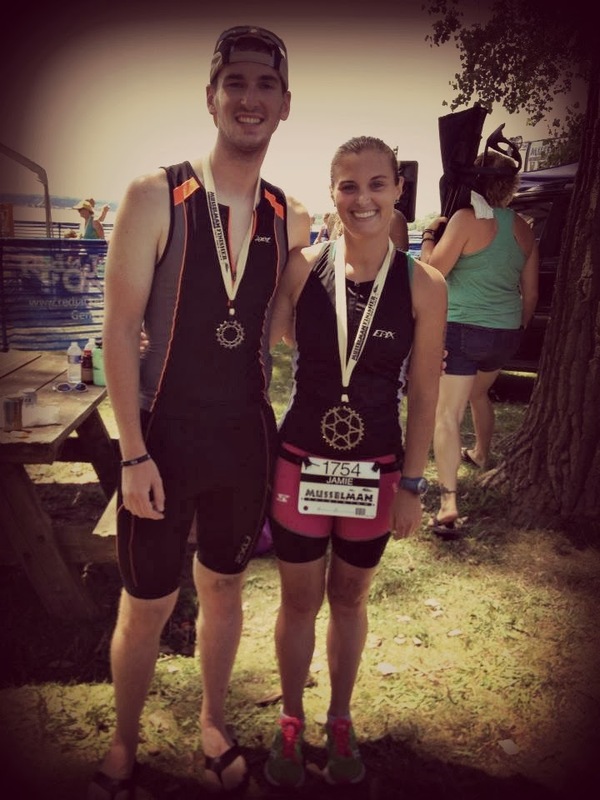 I love that you two share your passion for running and triathlons! What a sweet post Jamie! It is so nice to have a spouse that understands, runs/bikes/swims alongside you, and understands that Friday nights are usually early bedtime!